For a long time we knew that something was going to happen in Pucón. On February 5th Claudio saw lava in the crater of the volcano for the first time after 4 years. From February 6th it closed with no possibility of an ascent until further notice. In the middle of February you could see black smoke coming out and by the end of February even some lava rising to the surface. 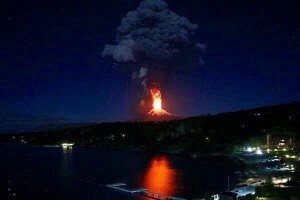 On the night of March 3rd, with an almost full moon, the volcano finally erupted. Even now, two weeks after the eruption, I can remember this special night quite well. Because of all the prior activity, of course I talked a lot to my roommate, friends and colleagues about a possible eruption. However, on Monday March 2nd, I went with my roommate to the supermarket to buy all the stuff we might need, mainly food you don’t have to cook and that doesn’t need to be refrigerated. So we bought some cookies, chocolate, long-life milk, bread and tuna. Furthermore I drew up a checklist in my head with things I would have to pack in case of an eruption. I don’t know why, but I was well prepared. That night I slept really badly. Normally I sleep like a rock – once asleep I only wake up when my alarm is really annoying me. But that night I turned from left to right, had a look at the clock and fell asleep again. Around 3 a.m. I heard our dog barking and yelping. Because I left my window open I listened for a siren signal but didn’t hear anything. Barking dogs in the street are not that unusual, so I decided not to think anymore about it. But when our host mother came up the stairs and said “chicas, levantanse, el volcan” I knew – the Villarrica Volcano is erupting! Due to my checklist I was quite quick. Jeans, warm pullover, scarf, jacket. Some chocolate and water for the backpack and within seconds I was ready to leave the house. Meanwhile the son of the host mother arrived and we drove all together to the center of Pucón, near the evacuation zone. And there it was wondrously quiet. I saw a lot of people walking towards the Peninsula, the official evacuation zone, but nobody was hysterical or panicked. Except for warm clothes, the most important item that night was the mobile phone. Everybody wanted to know if family and friends were ok and safe. Well, here in the center of Pucón, at 3.45 a.m., we saw the spectacle in the sky. We saw some lava coming out of the volcano and flowing down to its right and left side, but bit by bit it was getting less. Nevertheless, we waited until 6 a.m. before we got back home, everybody chilled to the bones and dog-tired. At this time the volcano was not completely quiet, but one of the wisdoms of my host mother was “the house is the safest place on earth, nothing has ever happened here”. Well, the alert was not reversed from the official side but because it was the 5th eruption in the life of my host mother I decided to believe her. Back home we all had a huge cup of sweetened tea and some bread or cookies and in this moment I realised how tense I had been the whole time. With the sunrise my patience came back and around 10 a.m. I went to bed and woke up at 3 p.m., right in time for lunch. Now I was really positive and thought that everything could go back to normal. So I washed some clothes and prepared myself for having a short walk around the city. But as soon as I walked downstairs, this plan was canceled. My host mother told me that now, after the small eruption, the volcano is closed and that this had never happened before. So it would be best to leave Pucón for some days. Within seconds my adrenaline was pumping again and I became quite nervous. I started to pack a little emergency-backpack with some clothes and called some friends in Temuco asking if we could stay in their house for a few days. Fortunately we received a lot of help gain from the host family because they all were leaving to Temuco and we could go with them. Later I heard from a friend that we really had luck because the bus tickets were sold out within minutes, for double the normal price. Anyway, from Tuesday until Saturday I stayed in Temuco – and Pucón was a ghost town. When I came back that Saturday evening I first felt a little bit nervous but then calmed down. This situation persisted for two weeks. Tuesday evening I was watching a movie and only wanted to check my Facebook account before I went to sleep. Bad idea. One of the first posts I read was “vamos Ruca, de nuevo” accompanied by a picture of the volcano releasing some lava. Ok, this was not good. So I started again to pack a small backpack – just in case – and went to bed with the window open. I think in a few more days I will get used to this situation and will become an expert at packing emergency backpacks.